Marc Chagall created his own unique style combining sadness and fun, flying people and a violinist dancing on doll houses. Chagall's world could easily turn upside down, goats and chickens could walk across the sky. Chagall's paintings are akin to poems written by brushes and paints on canvas. 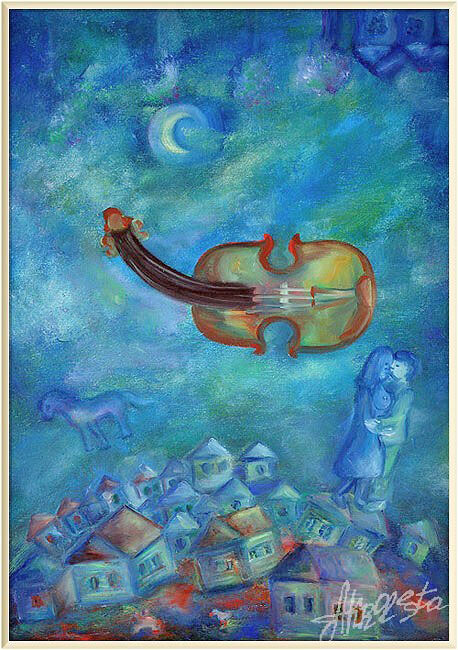 "Marc Zakharovich Chagall (born Moishe Zakharovich Shagal 1887 – 1985) was a Russian-French artist of Belarusian Jewish origin. An early modernist, he was associated with several major artistic styles and created works in virtually every artistic format, including painting, book illustrations, stained glass, stage sets, ceramic, tapestries and fine art prints. Art critic Robert Hughes referred to Chagall as "the quintessential Jewish artist of the twentieth century" (though Chagall saw his work as "not the dream of one people but of all humanity"). He had two basic reputations, writes Lewis: as a pioneer of modernism and as a major Jewish artist. He experienced modernism's "golden age" in Paris, where "he synthesized the art forms of Cubism, Symbolism, and Fauvism, and the influence of Fauvism gave rise to Surrealism". Yet throughout these phases of his style "he remained most emphatically a Jewish artist, whose work was one long dreamy reverie of life in his native village of Vitebsk." "When Matisse dies," Pablo Picasso remarked in the 1950s, "Chagall will be the only painter left who understands what colour really is."